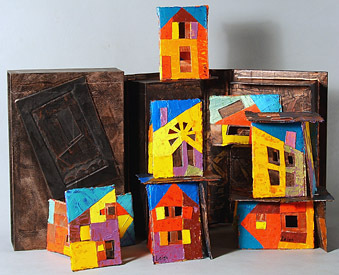 The Barrio y Calle series is inspired by urban streets and neighborhoods of the towns and barrios of the Sonoran Desert and the tropical cities of the Pacific Rim. 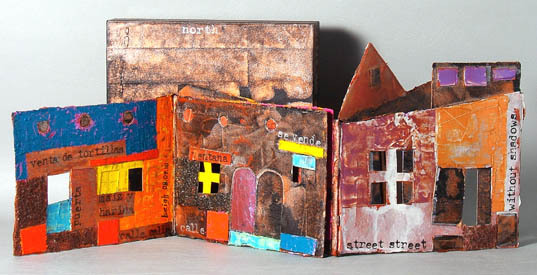 Some books in this series are based on a specific neighborhood and time, others combine impressions from many places. Each book is a signed, unique variant in its series. Figure 1: Calle Sin Sombras (08.04.10) a 5 page dos-à-dos book with slipcase. The Calle Sin Sombras/Street Without Shadows series opens to the Southwest's multi-cultural dos-à-dos sun-baked barrio neighborhoods. In the late 1980s, the new east-west rails of the Southern Pacific cut across old north-south foot and wagon tracks throughout the U.S.A.-Mexico borderlands. The railroad brought English speakers and peaked roof architecture to Spanish and Indian flat roofed pueblos. At the junctions, transitional towns created new forms, like the elegant arches in Mission Revival buildings. The House of Cards series plays with the creation, collapse and recreation of our built environments - the interplay between human fragility and resilience. The tablet cards suggest possibilities even in collapse. The clamshell box opened upright makes a starting wall to build out from or create free standing structures, whatever works! Figure 2: House of Cards (08.01.20) 24 tablet cards in a clamshell box with slipcase. All papers are acid free. Additional materials include Tyvek hinges, Ph-neutral PVA glue, Golden and Daniel Smith acrylics, plus a final coat of Renaissance Wax on the book pages. For available books in these series go to my artist's books catalog. Figure 3: Two Two's - a 5 page flag book with slipcase.